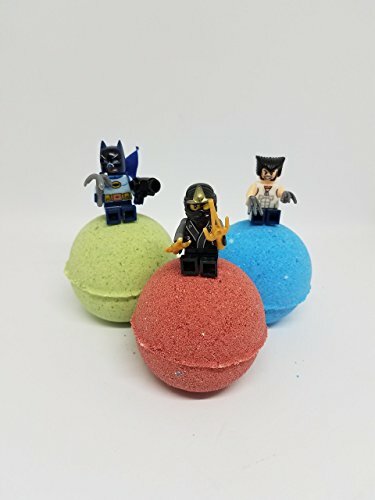 This is a set of 3 bath bombs, each bath bomb has a Lego type Minifigure inside, featuring a wide variety of Super Heros, Villians and More. Each bath bomb is approximately 5.5 ounces and 2.5 inches round and contains one figure each. The bath bombs will change the water color, fizz and bubble. Ingredients: baking soda, citric acid, epsom salt, corn starch, sodium lauryl sulfoacetate, coconut oil, fragrance, color. I have provided images of many of the Minifigures. While this is a good example, you may receive one other than those pictured. Toys are small, not recommended for small children due to choking hazard.